The final installment will be due by December 7, 2016, and the amount will depend on early bird pricing, whether you have a shared or private room, and if you are extending your stay. We will let you know what that amount is well before it is due. We like World Nomads, but ultimately you have to choose the one that is right for you. If you’re 70 years old or older, you’ll have to use a different company; we like Travel Guard. We’ll be asking for confirmation of your travel insurance before your departure. We love the services of these companies so much that we became affiliates, so we would ask that if you do choose to purchase these policies, you do it through our links. First and foremost, your passport MUST be valid at least 6 months beyond the end date of the trip, and you’ll need two empty pages in the Visas section of your passport (they must be Visa pages, not Amendment/Endorsement pages). You will need to arrange an Indian visa before you arrive. On this itinerary, you will only be entering India once, making you eligible for a Visa on Arrival. (Please click here to make sure your country is eligible for a Visa on Arrival). You can apply for a Visa on Arrival 4 to 30 days in advance of your arrival on this website. If you would like to receive a more long-term visa to India, you can apply through Cox & Kings Global Services, but you must allow more time for this process (start at least 3 to 4 months before the start of the trip). I don’t have a passport yet! What should I do? If you are a U.S. citizen, please click on this link to start the process. The standard processing is ~8 weeks, so please allow yourself plenty of time to apply and receive your passport (as you will need your passport information to apply for the Indian visa). Vegetarians will have no problem anywhere on our travels as Rishikesh is a vegetarian city (and alcohol-free)! The only thing that might prove a challenge is veganism in India. Although meat is entirely avoidable, India is the world’s largest consumer of butter, and it is almost unavoidable in most of their curries, stews, and even breads. Many vegans that I have known to travel through India adopt what is locally referred to as a “pure veg” diet: no meat, no eggs, but it allows for dairy consumption. (It is worth nothing that some of the reasons for avoiding dairy consumption in the west is slightly mitigated here, as there is less factory farming and antibiotic use in livestock.) Milk can be avoided by not consuming creamy dishes or milk tea. Gluten is also avoidable in India by choosing rice over chapatis and other local breads. Celiactravel.com has GREAT printable cards in local language to present to restaurants and hotels about your intolerance of gluten. Click here for the Hindi version. If you have multiple dietary needs, it may be worth your while to check out these specialty cards, available in 60 different languages. When you register for a trip, you will answer a set of questions, including a question about food allergies. We’ll take a look at your answers and let you know if we have any suggestions or concerns! Can I drink the water? In a word, No. Although many cities around the world are getting more advanced public water systems, we don’t recommend it. Not only from a pathogen standpoint, but it’s a different set of bacteria than your body is used to. Why risk an upset stomach if you don’t have to? We recommend drinking only bottled water, and you will want to rinse your toothbrush off in bottled water. What vaccines do I need? None are required to enter India, but we suggest you work with your physician or your area’s travel health expert to decide what options are best for you. You can read the CDC’s recommendations here and the Scottish NHS recommendations here. What about malaria? Malaria is not a risk in the areas we will be traveling, but again—we request that you work with your physician or travel doctor when making these choices. Please see our blog about this topic for more information. For more general tips on staying healthy while traveling, please visit our blog on the topic here. Do I need travel insurance? We require that our guests carry travel insurance because it just makes sense. It’s a relatively small expense but affords huge peace of mind! When choosing a travel insurance policy we require that you are covered for medical expenses including emergency repatriation. We also recommend you take out trip cancellation insurance, as this may cover cancellation penalties in certain circumstances if you have to cancel your trip unexpectedly due to illness, injury or unforeseen circumstances. We like World Nomads‘ Explorer Plans, but ultimately you have to choose the company and policy that is right for you. If you’re 70 years old or older, you’ll have to use a different company; we like Travel Guard. We’ll be asking for confirmation of your travel insurance 60 days before your departure. Please click here to get a quote. We love the services of these companies so much that we became affiliates, so we would ask that if you do choose to purchase these policies, you do it through our links. How much money should I bring? That is entirely up to you and how much shopping you want to do, as well as your love for extras like massages, alcoholic beverages, etc. All of your meals and transportation is covered, so you just have to gauge how much you want to spend on extras! How do I get the local currency? You can either exchange cash in India (although not at the airport, the rate is terrible!) or use a local ATM (which we prefer). Better yet, a combination of both! Just make sure you call your bank and credit card company to let them know you’ll be traveling in India, so they don’t put a hold on your card when they see it being used halfway across the world! Can I use a credit card? For large purchases (rugs, etc) many shops will take credit card (although they might charge a percentage on top of your credit card company’s international fee). For smaller items, count on using cash only. Can I opt out of activities? Absolutely! Nothing on these trips in mandatory. In fact, we build in a bit of downtime most days for self-exploration or rest, depending on how you’re feeling that day. We can help you build in extra activities, too, if that is your style. What kind of hotels will we be staying at? We take great pride in our hotel choices; it might be cliche, but we value location, location, location above all else! This often means little to no traffic, and that you can return to the sites on your own at any time. All of our hotels will be very simple but clean, and all have hot water and wifi. Will I be able to charge my electronics (phone, iPad, etc)? Yes, just be sure to bring along a 2-pin European style converter. Better yet, grab a Universal Travel Adaptor that can go with you anywhere in the world! Should I bring my mobile phone? We don’t recommend bringing your phone and using it with an international plan, as that can get expensive fast. If you do bring your phone, put it in airplane mode and use it for wifi at our hotels and restaurants. How can my family get ahold of me in an emergency? Before the trip we will give you a list of our hotels and their phone numbers; in addition, we will give you our Indian phone numbers ahead of time, as well as an American number good for text messages and voicemails. It’s important to understand the weather to really pack wisely! Rishikesh will be between 45° to 75°F, so layers are going to be your best friend! Here is a suggested packing list, clothing first and accessories second. Note: BJ and Lauren live out of their suitcases year round and they swear by packing cubes! Rolling your clothes (instead of folding) and using packing cubes make packing a dream! Clothing: Although more and more Indians are adopting Western wear, traditional clothing is very prevalent and modesty is the name of the game. In that spirit, please do not wear clothes that are tight, transparent or show too much skin, such tank tops or halter tops. We also discourage wearing form-fitting “skinny” jeans and shorts/skirts above the knee. Instead, we recommend wear loose fitting clothing such as long skirts, pants, capri-length pants, and blouses or Indian kurtas. 3-5 pair light cotton pants or long skirts. You may want to bring leggings (2 or 3 pair) to wear under your long kurtas, tunics, skirts or pants on chilly mornings or evenings (again—it’s all about the layers!) BJ is a fan of nylon pants, as they are lightweight and easy to clean. 4-5 cotton t-shirts, blouses, or long sleeve shirts. You can always have laundry done at the hotels, but bring as many as will make you feel comfortable. A jacket for chilly morning or evenings. Bring a few pairs of socks. Light wool (like SmartWool) or tech socks work very well. Sleeping attire: our rooms will not have heat in them at night (although they will have plenty of blankets), so please make sure you bring sleeping attire to keep you warm! Comfortable walking shoes, sneakers and/or hiking shoes. You can also bring comfortable slip-ons for use around the hotel and airplane, of course. If you’d like to bring an older pair of sneakers and donate them at the end of your stay (along with any clothes, coats, socks…), they would be put to very good use! A pair of sandals or flip-flops, if you wish. They’ll be convenient for around the hotels, local excursions, and the Golden Temple (when you have to check your footwear at the door). Walking sandals (such as Teva’s or Chaco’s) would also work. Sarongs are super handy for so many reasons (men and women). Makes for a good cover-up, eyeshade, pillow, scarf, napkin, tissue, etc. These will be readily available early in our travels. A hat with a brim is a great idea for our daytime adventures. Ear plugs and eye shades to help you sleep better and recover from jet lag more quickly. BJ swears by this! Click here for more of our tips on preventing and dealing with jet lag. Good sunscreen. Lauren prefers mineral-based ones like Devita: good for you, good for the environment. How do you know if it’s mineral based? If the active ingredient is either titanium dioxide or zinc oxide—that’s it. They might be a little pricier initially, but a little goes a long way. If you do bring your camera, don’t forget extra batteries and/or your charging cord! You may want to think about an extra memory card, too. Headlamp or flashlight for ease of movement after dark. At least one bandana, as they’ll come in handy for wiping hands, faces, covering heads, etc. Though they’ll loan us a bandana at the Golden Temple, you can wear your own head covering—a nice idea. Toiletries. Not all of our hotels are guaranteed to have shampoo and none will have conditioner, so be sure to bring some of your own if you prefer a specific brand. Please note that you can buy products in Rishikesh at the Organic Store. People tend to think they need to bring toilet paper to India—not true! However, bringing a few packs of travel tissues isn’t a bad idea, to keep on you for public restrooms. Wet wipes and/or hand sanitizer. Nothing replaces good ol’ hand-washing, but this will work in a pinch. Ladies will want to bring any necessary feminine hygiene products with them. VERY IMPORTANT! A print out of your RETURN airline ticket itinerary; you’ll need this to enter the airport to get home. You can also have it readily accessibly on your phone (you may want to save it as a photo). Raincoat. Umbrellas are sometimes no match for the strong early morning wind, and it is likely to rain at least once. A raincoat can be an extra layer on top of a sweater or sweatshirt for cold early mornings, like our sunrise trip to the mountains. Small notebook and pen for journaling purposes, if you desire! Please scroll down within this box to reach the end of the questionnaire and contract. At the end of the contract, you will see a “submit” box—please hit that button. Your spot is not considered reserved until you have completed these questions and contract on the website. IF YOU ARE HAVING TROUBLE FILLING OUT THIS FORM WITHIN THE PAGE, PLEASE CLICK HERE TO GO DIRECTLY TO THE FORM. **There is a minimum number of guests that must be reached before this trip is confirmed. We will post on this page when that minimum has been reached. At that time, you are free to purchase your flight. These flights are just suggestions. Please be sure to double-check dates and times to ensure it works for your itinerary. We get no commissions for the flight you purchase. We suggest you purchase directly through the airline website. Industry research suggests that the optimum time to purchase a flight from the US to Asia is about 159 before the start of your trip. We are, however, big fans of purchasing your flight as soon as possible, as soon as the trip is confirmed after reaching the minimum number of guests. Below we will post good flight options we find that will match up well with the dates of this retreat. If you don’t see something you like; or prefer a different origin airport; or of you plan on arriving early, staying late, or going on to another destination – please let us know and we will be happy to assist you. Contact BJ at [email protected] and he’ll help you find exactly what you need. Note: Since the trip begins on 5 February, you will want to find a flight that arrives before midnight on 5 February (those usually depart the USA on 4 February). For your departure date from Delhi, make sure you choose something that departs after ~9pm on the 13 February (it’s OK to depart after midnight on 14 February). This flight below is the best one from Boston. There are no non-stop flights to Delhi from Boston, but this has an easy/short connection in Dubai (a nice airport). The cost as of 7/28/2016 is $847 booked directly on the Emirates.com website. The flight arrival and departure times are fantastic and the price is good. This would be for someone who doesn’t want to arrival early or extend their trip later. But similar flights can be found for other dates. Emirates, btw, was rated the best airline in the world for 2016. It is an exceptionally comfortable airline to fly — even in economy class. This particular option (below) is from JFK. Booking directly at the airline (AirIndia.com) the price is currently (as of 7/28/2016) $937. It is a non-stop roundtrip flight. The times perfectly match up with the retreat [it arrives in the mid-afternoon of the 5th and departs in the early morning hours of the 14th]. There are cheaper flights on other airlines, but none are better than this non-stop. If you’re looking to spend less for your flight, Turkish Airways is the place to go. From either Boston or NYC flights can be found under $700. In all cases, you would have a layover in Istanbul. Turkish Airways was recently ranked the 7th best airline in the world (far better than any U.S. based carrier). You can search on their website or on Kayak.com for details. The main problem with the Turkish Air flights are the arrival times aren’t quite as good as the options I listed above – but it is a good option and would save you money. From Miami I feel SwissAir offers the best option. It arrives just after midnight on the 6th, but that will work fine — especially if you can sleep on a plane (most flights from Miami arrive to Delhi in the wee-hours of the morning). The price is good and the layovers aren’t too long. Swiss Air is ranked #15 in the list of world’s best airlines. As you get away from the coastal cities (west or east) prices go up a little and flight-times go up a little. That said, the best option from Denver is pretty good. It’s on Air Canada and is $997 as of 7/28/2016. Again, if you need any assistance, please write BJ at [email protected] There is no fee or commissions for this valuable service we provide. If you’d like to extend your journey before or after this retreat, we would be more than happy to help you plan your stay! We can advise you on hotels, flights, and itineraries, whether you want to arrive in India early, stay afterwards, or venture to somewhere else in South or Southeast Asia at the end of the trip. We offer our retreat guests free travel consulting, normally a $200 value. Continue on in India and explore Varanasi, Jaipur, or even head to south India. Consider a visit to one of our favorite countries in the world, Nepal! Please read below for two very special trip extensions from Rishikesh! Not ready to leave this magical country? You can visit the holy city of Amritsar if you wish! After your Rishikesh retreat, you’ll fly from Delhi to Amritsar, a short 45 minute flight but to a whole new world. Amritsar is the seat of the Sikh religion and the home to the Golden Temple, Harmandir Sahib. Our favorite accommodation (and yoga studio) is impossibly close the temple itself–and you can feel it in the air! It is the perfect home base to explore Amritsar. Amritsar has so much to offer, and the Golden Temple is the shining jewel in its crown. You’ll take a guided tour of the Golden Temple and grounds, including the remarkable kitchen and dining hall that serves 50,000-150,000 FREE meals per day. You’ll have the opportunity to perform seva, or volunteer service, in this kitchen area, as well. One of the reasons we chose to form a partnership with this hotel in Amritsar is because of its location, a mere 108 steps from the Golden Temple. You can choose to go back and visit at any time of day or night by yourself for contemplation, seva, or to engage in discussion with some of the friendliest people on the planet. If you can bear to tear yourself away from the high vibes of the temple, we have other goodies in store. Amritsar is in the state of Punjab, known as the bread basket of India. You’ll have the opportunity to explore a rural village and working farm in this fertile region. You can also attend the nightly Wagah border closing ceremony; every night since 1959, this border between India and Pakistan has hosted a high-energy, wonderfully-choreographed closing ceremony that resembles a pep rally more than an official exercise! We think that no trip to India is complete without laying eyes on the marble marvel dedicated to love, the Taj Mahal. You can take a private vehicle (~4-5 hours) or train (~2 hours) to the city of Agra. Agra has many treasures to offer–the Taj Mahal is just the iconic cherry on top. If you have time, you can visit the impressive Agra Fort, a huge and stunning complex with gorgeous courtyards, intricate marble architecture, and a rich history. You can also get your first sneak peak of the Taj Mahal from Agra Fort! You’re arise early for the best view of the Taj Mahal, not to mention to beat the heat and the crowds. 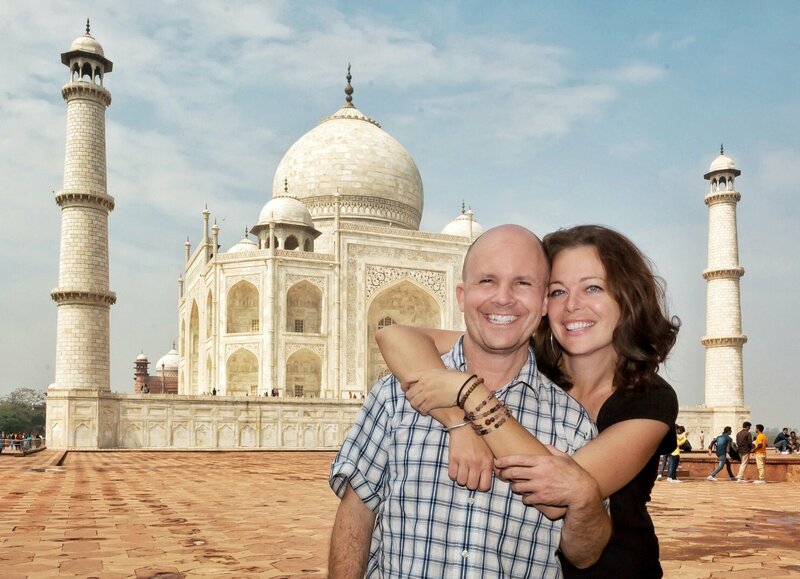 You’ll tour the Taj Mahal along with our good friend and local expert, and then have time to explore on your own. John Keats once wrote, “A thing of beauty if a joy forever,” and we think this monument to love embodies this line perfectly. After the Taj Mahal visit, you’ll make your way back to Delhi to depart for home or your next adventure! Taj Mahal Extension: Please contact RetreaTours for a price, based on your preferred mode of transportation and length of stay. Extensions start from just $150! Other questions? Contact RetreaTours through the box below.